Product Management vs. Product Marketing. The struggle is real. Every so often I get into a discussion with someone about the difference between Product Management and Product Marketing. When an organization has both roles, it seems to inevitably cause some degree of angst. What do Product Marketing does? 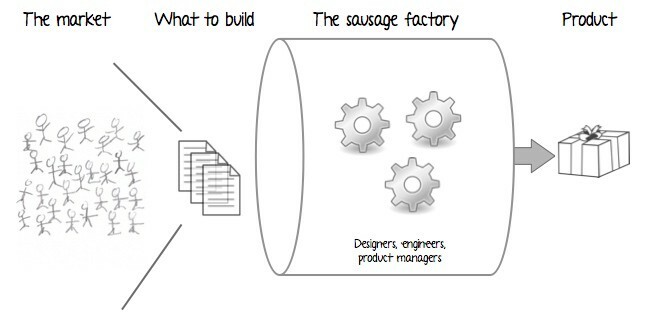 What does Product Management do? Are Product Managers just supposed to implement what product marketers say? Or do Product Marketers make recommendations for the product manager to decide? This post will try to disambiguate the roles as well as offer a view on product marketing/management configurations. The simplest thing to address (and which most people I think understand) are the “outbound” activities of Product Marketing. This is stuff like developing marketing collateral, working with the sales team to develop sales pitches, developing a go-to-market strategy, figuring out which customers segments to go after with a given product, etc. These activities are not intended to influence what is being built. Rather, they take the product as a given and are focused on helping ensure adoption of the product. Most people I talk to understand this set of activities and how they differ from Product Management. The “in-bound” Product Marketing function (as well as other roles such as “Business Product Management,” and “Product Strategy”; at PayPal in the late 2000s, we had the role “Business Unit Manager”), typically focuses on the front end of this funnel. These activities address issues such as target market segment, customer, vertical strategy, business model, etc. In the early 2000s, the result of this work was a “Marketing Requirements Document”, or “MRD.” This MRD was a medium-length document (usually 5 to 20 pages) that is supposed to do exactly what it’s called — it describes what the market needs (requires) in a product. The problem was that some MRDs were very high level (e.g., culminating in “a weekly tracking system that integrates into employee’s daily workflows) and others would get very specific (e.g., “status reports should be one single field, plain-text format only, and automatically added to the relevant Google Calendar event immediately upon report submission). So if you’re Product Manager or Product Marketer reading this, you can easily start seeing the problem. Shouldn’t a Product Manager be doing at least some of this work? If not, what work should she be doing? This is what PayPal did in 2007. We had Product Marketers (they were called “Business Unit Managers”) who were responsible for the more “market-facing”, strategic questions. They were then coupled with Product Managers who were responsible for working with the development teams to specify and build the actual products. This was hugely problematic. While Product Marketing was responsible for strategy (essentially), they had no skin in actually building the product. This created a strange dynamic — are Product Managers supposed to build what the Product Marketers wanted? If so, that relegates the Product Manager to a spec monkey. Or are Product Managers supposed to take the Product Marketer’s ideas as simply recommendations? This gives Product Managers ownership, but then the Product Marketers are more like internal consultants. And to make matters worse, PayPal hired individuals with similar profiles (namely MBAs from good schools) into both roles. So you had two sets of similarly oriented people in different roles, fighting for direction of the product. Product Managers thought Product Marketers didn’t add any value; Product Marketers thought Product Managers didn’t know what they were doing. It was a terribly fraught arrangement, one which resulted in continuous tension and distraction. Management ended up doing some strange things as a result, like creating a new role called “Technical Product Manager” (basically a spec monkey). Having said all that, this configuration can work, but usually after a certain level of complexity or size is reached, and only with a clear understanding of who owns product direction. More on that later. Now I’m a Product Manager, so of course I’m going to like this approach :). In my somewhat biased view, I’ve found that this configuration is much more effective at least up to a point (e.g., company size). The Product Management function should be scoped so that it includes the market and customer-facing elements such as figuring out what market segments to go after, what order to go after them, what customer/user types to prioritize, etc. A Product Manager should own her own strategy. She should be out talking to customers, identifying pain points, developing solutions. The “CEO of your product” is a bit overused, but I do think it’s applicable in this situation. A CEO shouldn’t delegate company strategy and Product Manager shouldn’t delegate product strategy. The objection I often hear is that this is too much work for one individual. That’s certainly possible. But I think it’s better to support that individual by adding, say, an analyst to help do things like competitive analysis than it is to create an entirely adjacent function to do the same. And if, as a leader, you don’t have confidence in your Product Manager to handle these responsibilities (in addition to working with the development team to build the product), you should ask yourself why. If it’s consultative, is the Product Marketer okay with that? If it’s through negotiation, are both the Product Market and Product Manager clear on the nature of that negotiation? If it’s directive, is the Product Manager okay with that? One issue I’ve seen is that some companies try to make this transition too early — they want Product Marketing in addition to Product Management when there isn’t enough work around for both. A lot of high-growth companies have the philosophy of hiring ahead of the curve when they can. When talent is scarce as it is in the Bay Area, this can be a very wise approach. But just make sure the ownership of product direction is clear so people spend less time bickering and more time building. East Coast transplant living in SF. Product person. Appreciates when things just work.